quote - Geiger's Fence Erectors Ltd.
*PLEASE NOTE: for commercial or industrial projects please call (306) 569-9382 or email plans to kathy@geigersfence.com. An on-site meeting with the estimator can be set up if required. The total fence distance including gates. See #3 in drawing above to locate corner posts. See #4 in drawing above to locate end posts. See #5 in drawing above to locate walk gates. Walk gates are any gate up to 5ft wide. See #6 in drawing above to locate vehicle gates. Vehicle gates are any gates over 5ft wide. *Single Swing gates are one gate panel that opens and swings in one direction. 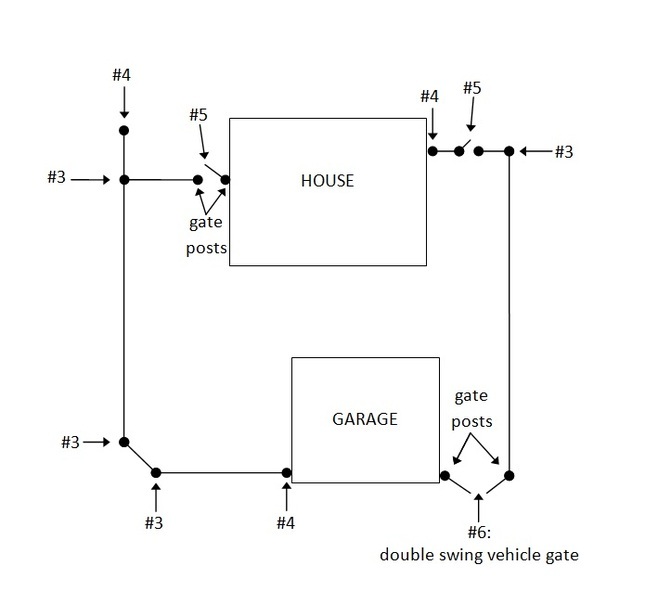 *Double Swing gates are two gate panels that open in the middle and swing away from each other. *Cantilever gates are one gate that rolls open from one side. Fences come in heights ranging from 3ft to 12ft high. Typical residential fences are not taller than 6ft high. *Coloured mesh is vinyl coated. Comes in black, white, brown and green. *All coloured means powder coated posts with vinyl coated mesh.